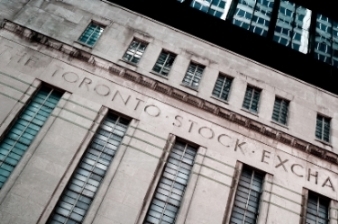 Gains for the natural resources sector helped keep the main index of the Toronto Stock Exchange slightly higher despite data which showed a growing trade deficit and a downgraded outlook for the Canadian economy by the IMF. Oil prices, part of the reason for the economic downgrade, are currently trending higher with Brent Crude above $50 Tuesday, while gold, silver and copper are all gaining. Asian and European markets also ended their respective trading sessions mostly higher while Wall Street was mixed with the Dow very slightly higher and the S&P and Nasdaq slipping below the line. Data from Statistics Canada shows a widening trade deficit for Canada. Exports were down 3.6 per cent in August while imports increased 0.2 per cent. Export prices were down 3 per cent while volumes were down 0.3 per cent. Import prices were up 0.3 per cent and volumes were down by 0.1 per cent. The trade deficit with the rest of the world widened to $2.5 billion in August from $817 million in July. Exports to the US were down by 3 per cent while imports from the US declined by 0.8 per cent. Exports to other countries fell 5.5 per cent with imports up 2.2 per cent. The outlook for Canada’s economy for 2015 has been cut to just 1 per cent by the IMF, down from its previous 1.5 per cent forecast in July. For 2016 it forecasts 1.7 per cent, down from its previous 2.1 per cent outlook. Oil prices and lower energy sector investment are the main reasons. The organisation also cut its global outlook to 3.1 per cent although the US forecast was increased to 2.6 per cent. Bombardier has reportedly offered a majority stake in its C series jet to European rival Airbus. The Globe and Mail reports that sources close to the deal revealed that the tie-up would bring much needed funds into the Canadian firm and help it break into the market that is dominated by Airbus and Boeing.